Ok Ok so the blog has been simmering on the back burner as the new year has come and gone. We are enjoying our lives as a married couple and have adapted our lifestyles in various directions since this blog has started back in 2009... 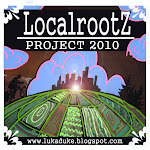 Seems so long ago, if your interested check out the first three posts of the initial localrootz project ( Day One * Day Two * Day Three ). So what does this mean for the blog ? Is this the end... No in fact it is a new beginning, I am excited to add some much needed variety and less regimented posting. So please do not be surprised if you start noticing a smorgasbord of postings touching on music, art, food, restaurants, wine, beer, farms... I have so many ideas... but no promises. Here is a peak into the last few months of research ! the cows at Savage Oakes Winery in Union, Me. Check em out @ SAVAGE OAKES Vinyard & Winery ! This was one of the many amazing stops on our midcoast honeymoon. We arrived there after spending lunch time eating strawberry shortcake at Beth's Farm Market and visiting Sweetgrass Farm Winery & Distillery for a tasting. Keith at Sweetgrass gave us a personal tasting right in the barn where the all the magic happens and we had a hard time finding something we didn't want among his vast array of products... they really are all worth trying. Ok I digress, it was a fun filled day and these three great places are all within a half hour of each other by car... daytrip by bicycle. Anyway as we pulled into Savage Oakes we were greeted by a friendly dog and a fella on a ladder who was painting the small barnshed-store. Inside we met Holly Savage and she actually had recognized us from the Portland Press Herald article where we mentioned their wine as one of the few Maine wines that are made using Maine ingredients and in their case as you will see actual GRAPES ! Top three Savage Oakes Wines ! (This port, we are proud to say, is Maine's first and only estate grown grape port. We took two years to age this port, allowing some of that time to be spent in oak. Its well balanced acids allow the sweet to linger but not be overbearing, while the 19% alcohol warms on the way down. Pairs well with a warm fire while a winter's nor'easter blows outside. A wonderful way to end any day. WOW I think the description says it all YUM ! I remember we got a tasting menu... a highlight was Shime-saba, locally pickled mackerel that was bought from the fisherman live ! So fresh we had never realized how good mackerel could be ! Great cocktails, atmosphere is casual, menu is well thought out and local ! Amazing and well worth a visit ! True farm to table experience that kept us grazing at our table for over two hours. So many highlights and so long ago... the big news was we ordered up a Farmer's Salad for an appetizer that was all home grown including the house cured Primo raised bacon. Yes the time had come after 10+ years as a vegetarian and 2+ years as pescetarians for both of us... we took the plunge. Much more on this decision in a future post. Other highlights of 2011 was our visit to Raven Hill Orchard in E. Waterboro! Vartanian Lightining, Macoun, Black Oxford, Golden Russet, Arkansas Black and many more ! This would be a great gift for the wine lover who has everything. Thanks for the great post.